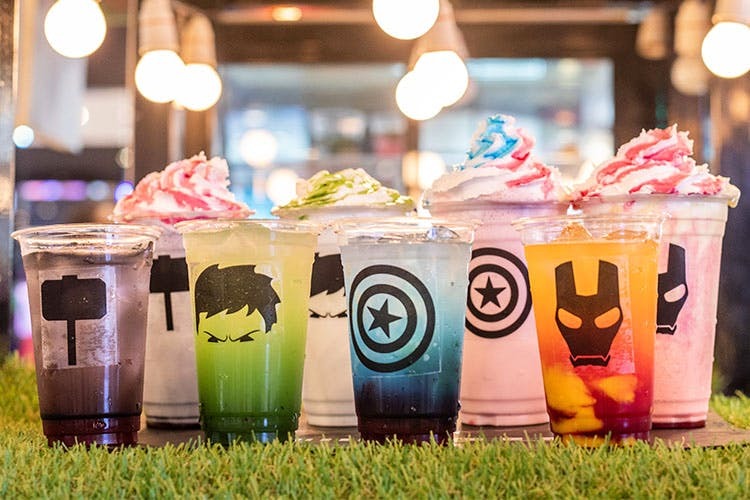 How Cool Are These Avengers Themed Smoothies & Lemonades? We can’t go through our social media feeds and WhatsApp chats without being bombarded by a hundred mentions of the Avengers, Thanos, or that ultimate cliffhanger of an ending. So, if we’re going to be talking about the movie, we’d better have a drink in hand to go along with it. Farmacy in Select Citywalk is doing a range of Avengers-themed smoothies and lemonades that look and taste absolutely amazing! They’ve got Thunder Shake in activated charcoal and strawberry flavours, Cap Old-Timer in blueberry and strawberry, kiwi-flavoured Gama Radiation, and Jarvis’ Juice in mango and strawberry—all of these are available as either a smoothie or a lemonade (take your pick)! Farmacy also does delicious (and very Instagrammable) strawberries and cream topped with chocolate sauce. Sweet Snacking: We're Running Over To This Cart Serving Strawberries & Cream With Chocolate Sauce!